Though she grew up in the countryside of Somerset, Katie was determined to move to London, be successful and reestablish herself as Cat. Everyone around her seems to have a glamorous life, while she has a tiny room in an apartment in a dismal part of London. She can't tell her family about the reality of her life, so she's lost and devastated when she's abruptly fired. Returning home, she helps her father and stepmother begin a new business while "on sabbatical." The office politics soon catches up with her when her boss arrives for a vacation. Katie is a fun character, even when bemoaning how difficult it is to live in London. She and her family are very easy to relate to and fun to read about. 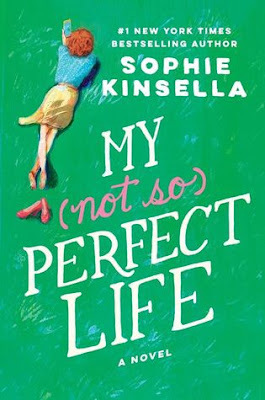 It's rather formulaic, because Katie is prettier than she thinks she is, the friends she thinks are so glamorous really aren't, her boss' life isn't as perfect as it seemed, and rumors are not facts. Because she was working in the branding business, of course she had the contacts and knowledge to get her parents' business off the ground and grow into a successful vacation spot within a few months' time. That she gets a measure of revenge against her boss is also very believable. While the ending itself was a bit of a reach, I thought it added to overall charm of My (Not So) Perfect Life.